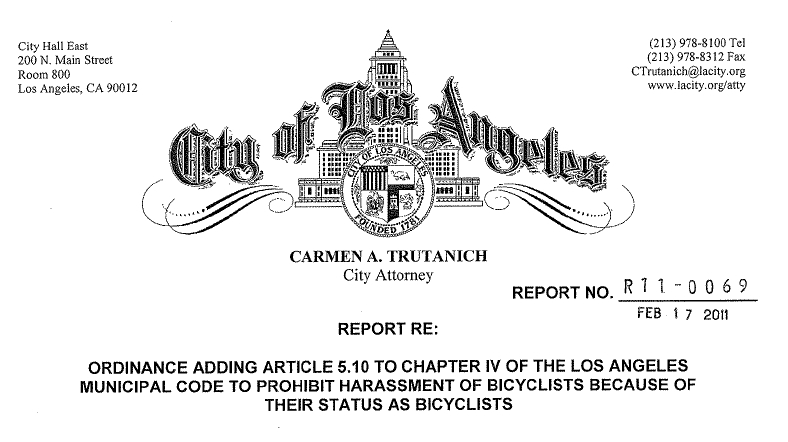 We here at the LADOT Bike Blog just heard from our sources in City Hall that the precedent-setting Bicyclist Anti-Harassment Ordinance will go before the full City Council sometime in the next two weeks. Many bicyclists can relate harrowing stories of an out-of-control driver assaulting them simply for being on the road, and the ordinance scheduled to come before City Council aims to give bicyclists a tool to fight back against the daily harassment to which many have been subjected. With the coming vote at the California State Legislature for the “Give Me 3” legislation, July is shaping up as a huge month for LA bicyclists. Bicyclists from all over Los Angeles, all over Southern California, and all over the country should keep their eyes on this groundbreaking ordinance and support the City’s decision to provide bicyclists with tools to protect themselves on the road. (Ed Note: Most information on Bicycle Friendly Street treatments come from the Technical Design Handbook in the 2010 LA Bike Plan. Though we are happy to present it in bite-sized pieces, we highly recommend you download it yourself and have a good read. You can download the Technical Design Handbook here. For a refresher on what a Bicycle Friendly Street is -also called a Bike Boulevard- you can read our introductory post here. You can also find previous posts on chicanes, round-a-bouts, loop detectors and other BFS treatments here. 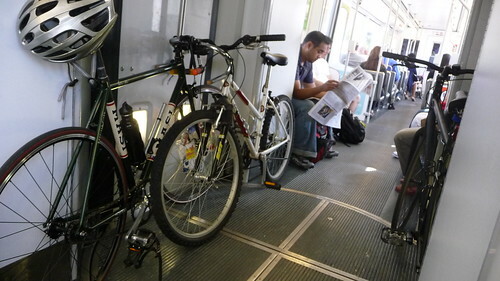 The LADOT Bike Blog hopes everyone had a nice Bike Week LA 2011. To commemorate this year’s “Bike Friendly LA” theme, the LADOT Bike Blog continues its ongoing series detailing the specific treatments that go into making a Bicycle Friendly Street (BFS) – a big part of LA’s bicycle friendly future. Today, we will take a look at the Traffic Control Device (TCD) known as signage. 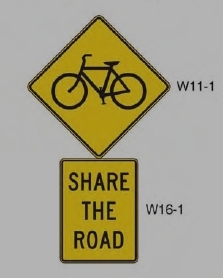 Signage is considered a “Level One” BFS application based on its relatively low level of physical intensity. It is important to note that BFS applications are site-specific, and that not all streets require the highest application treatments. 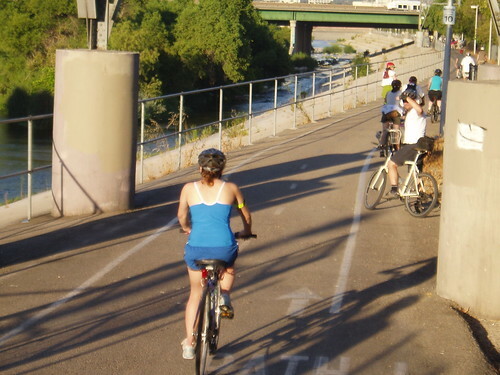 The Bike Plan Technical Design Handbook (TDH) recommends gathering community input along with the necessary engineering and design work to determine the level of application necessary for each individual street. It’s been a long road, hasn’t it? It’s the beginning of the end for a planning process that began back in 2008: The draft 2010 LA Bike Plan comes before the Planning Commission in City Hall Room 1010 this Thursday, November 4th, at 8:30 AM. If passed, the plan will move on to a hearing before the City Council. 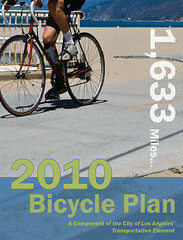 If you need a last minute refresher, you can always bone up at labikeplan.org. 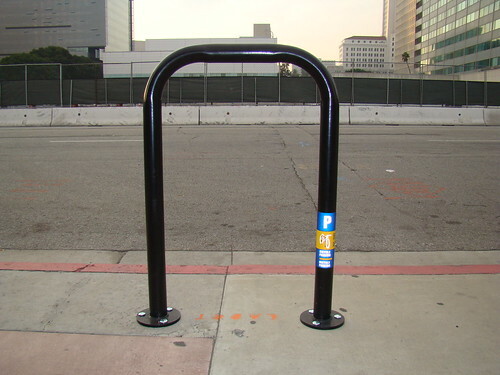 The LADOT Bike Program has installed over 3,600 bike racks and 446 meter hitches in the City of Los Angeles. We’ll soon be adding as many as 1,700 additional bike racks in business districts over the next two years. In the short term, the LADOT Bike Program is aiming to install around 100 new racks every month for the rest of the year. Even better, we install them at no charge. 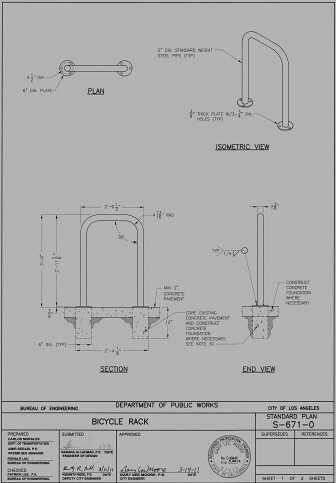 With so many bike racks to install, LADOT needs your help to find the best places to put them. Sure, we could find locations to put in bike racks by ourselves, but we think it’s better to crowdsource possible new locations. After all, bicyclists who ride the streets of LA every day know best where demand for bike parking is highest. Rick Risemberg of Bicycle Fixation already took advantage and wrote about his request, and the subsequent installation, in the Larchmont neighborhood. If you want them, ask.